Ah, the American South-a region filled with charming cities, good people, and better food. Although temperatures can soar during the summertime, we think it&apos;s worth braving the heat for a taste of American history and diverse culture that only the South can provide. Even better, summer is considered off-season for most of these destinations so you&apos;ll be able to score some sweet deals on hotels and more. 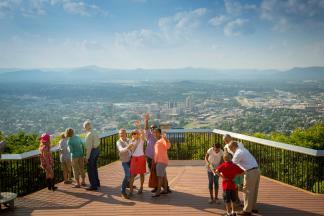 So we put together four summertime itineraries for your Southern touring pleasure. It&apos;s a big swath of land, so don&apos;t expect to cover it all in one trip (or even one summer). But these are the best places to start. The 469 miles of the Blue Ridge Parkway through the Appalachian Mountains provide a route of outdoor activities for nature lovers. Start at Mile 0 near Waynesboro, Virginia for half and full day fly fishing trips with the South River Fly Shop along the South and Shenandoah Rivers. Continue along the winding parkway, passing overlooks of gorgeous scenery to Mile 120 at Roanoke Mountain. Fuel up with a fresh juice and locally-sourced meal at Firefly Fare in downtown Roanoke before hiking the 8.3 mile McAfee Knob trail. McAfee Knob summit is the most photographed spot along the Appalachian Trail, and features a panoramic view of the Catawba Valley. Head into North Carolina, passing Cumberland Knob and Grandfather Mountain on your way to Mile 384 and the hip town of Asheville. Grab a healthy breakfast at Green Sage Cafe, one of Asheville&apos;s first green dining destinations, before trying some adventure in the sky at theAsheville Treetop Adventure Park. Fly Tarzan style through 50 unique climbing, zip line, and rappelling challenges anchored to over 30 trees. Next, take it to the water for a challenging Stand Up Paddleboard Yoga class with Mind Body Paddle on Lake Julian. Where to Stay: The Iris Inn, located in Waynesboro, Virginia is the perfect mountain retreat for a journey through Appalachia. Stay in one of their brand new cabins (think adult tree houses) with floor-to-ceiling back windows that provide unobstructed views of the Shenandoah Valley. In Roanoke, Virginia, book a room at The Inn on Campbell, an elegant four-room inn located steps from the shops and restaurants of downtown. Finally, celebrate the end of "America&apos;s Favorite Drive" at the old-world Grand Bohemian Hotel Asheville. Historic buildings, Spanish moss-covered Palmetto trees, Magnolia-scented air...it&apos;s hard not to fall in love in, and with Charleston, South Carolina. Beyond its fantastic food and hotel options, Charleston has unique activities for couples looking for a charming getaway. Go for a private tour with Palmetto Carriage Works as a guide regales with stories about antebellum mansions, historic landmarks, and beautiful parks at the leisurely pace of a horse drawn carriage. Request a table on the porch overlooking Queen Street for lunch at Husk, a truly iconic Charleston dining institution. Order the South Carolina shrimp and Geechie Boy grits. Walk off lunch with a bit of shopping on King Street. Then spring for a touch of relaxation at The Spa at Charleston Place, in the gorgeousCharleston Place Hotel. Indulge in the Therapist&apos;s Choice couples massage which incorporates elements of Swedish, Reflexology, and Deep Tissue. For an extra $25, body treatments at the spa include all-day access to the terrace sunbathing area, pool, and hot tub. Where to Stay: Nestled in the Ansonborough district is the brand new 18-room Zero George boutique hotel, a collection of five beautifully restored townhomes gathered around a central courtyard. Guestrooms feature high ceilings, contemporary furnishings, and open-air piazzas. North Carolina is a food-lovers paradise. A diverse geography of mountains, coast, farmland, and city make for a unique mixture of homegrown foods, beer, and liquor. Start in Asheville on a walking tour of downtown with Eating Asheville food tours. Stops range from Indian street-food to fine chocolate shops. Make a dinner reservation at theRed Stag Grill, where Chef Adam Hayes serves modern European comfort food complemented by local ingredients. Drive east to Chapel Hill to discover a food world beyond college eats.Taste Carolina offers walking tours of Chapel Hill and neighboring Carrboro that highlight everything from coffee shops like Open Eye Cafe to the new TOPO Distillery. For dinner, Lantern&apos;s from James Beard award-winning chef Andrea Reusing is a can&apos;t miss. Save one night for dinner in Raleigh at Beasley&apos;s Chicken + Honey from hometown girl Ashley Christensen for some of the best fried chicken you&apos;ll ever eat. Then head south to Charlotte. For a taste of Uptown (Charlotte&apos;s downtown area) try the Soul of the South tour from Feast Food Tourswhich focuses on southern restaurants. Head to the historic South End district for dinner at Bonterra Dining & Wine Room. The restaurant is housed in a renovated 110-year old church, and offers more than 200 wines by the glass, and another 300 from the private cellar. Discover which wine goes best with their signature fried lobster tail. Spend your last day in Charlotte in the NoDa arts district. Grab coffee and a croissant at Amelie&apos;s French Bakery, an authentic-as-they-come French bakery. Finally, head to Heist Brewery for award-winning handcrafted beers, and whimsical bar bites. Try the chicken and waffles sushi with a flight of seasonal brews. Where to Stay: Just 15-minutes outside of Raleigh in the town of Cary is the art and nature-inspired Umstead Hotel & Spa. The pièce de résistance is Herons, the property&apos;s restaurant that uses fruits, vegetables, and herbs from their nearby farm. Opened in 1929, The Dunhill Hotel in Uptown Charlotte has long been a favorite of literary figures and entertainers. Just next door is the Harvest Moon Grille, a farm-to-table restaurant where ingredients are sourced from within 100 miles and the menu changes daily. The Big Easy is known as an adult playground, but most are unaware that it&apos;s also a great place for families, full of educational activities, parks, and delicious food. Start the day with crispy waffles at the French Quarter location of Camellia Grill, a local favorite. Snag a ride on the famed St. Charles Streetcar on your way to one of the Audubon Zoo, the Audubon Butterfly Garden, or Insectarium. After all that activity in the New Orleans heat, take a ginger-cayenne sno-ball break atHansen&apos;s Sno-Bliz on Tchoupitoulas Street. End the day on a relaxing note with a family dinner cruise along the mighty Mississippi River on the Steamboat Natchez. Give the kids (maybe just the older ones) a bit of a spook at the New Orleans Historic Voodoo Museum, where they&apos;ll spy everything from voodoo dolls to gris-gris potions. Keep the adrenaline rush going with a swamp tour with Cajun Encounters. You&apos;ll hop on a flat-bottomed boat and tour the area&apos;s swamps with the chance of seeing animals like alligators, owls, wild boars, turtles, snakes, and more. Reward the kids (and yourself) with a stop at Aunt Sally&apos;s Pralines, for a taste of local classic, praline candy. Where to Stay: Historic Hotel Monteleone is located in the heart of the French Quarter and features a heated rooftop pool that is open year-round. Try the All About Kids package which includes admission to the Louisiana Children&apos;s Museum, and your choice of tickets to the Audubon Aquariam of the Americas or the Entergy IMAX Theater.